Practice!!!!!! No really. Some people need to be told. It could be a phobia held-over from piano lessons in the 5th grade. Decide exactly the material you would like to include on your CD. Make a list of the songs you want to include, and then go over the order that you think the songs should be in. (This could change as the recording gets closer to completion) Now add a couple of more songs to the list just to make sure you are ready in case a couple of the original picks need to be dropped for one reason or another. Write down the lyrics and make a song map. The recording engineers and all the musicians should have a song map for each song. If you aren’t familiar with one, we can give you an example sheet. It’s basically the lyrics (double or triple spaced preferably) with notes included to show where the solos come in, where the backup vocals come in, key changes, rhythm changes etc. You won’t believe how much this will help. Decide on your Cover and insert artwork in advance. Discuss with the rest of the band and decide what you want your cover to look like, and what info you want included on the back and on the insides cover. Sure, 8 page foldouts look cool, but seriously, how many people look at them? These days most people have their cds stuck in a vinyl zipper case they carry in their cars. What you want to consider is a cover that will make them buy your cd instead of the other 50,000 that are already out there. Use New Strings!!! Make sure to bring spare strings, picks, drumsticks etc. that you might need for each session. Bring along some snacks and drinks. We’ve got a fridge and microwave available, but we don’t keep a full time chef around. This can be arranged however for the right price. Use the equipment you are used too. Just because your cousin Larry has a new Marshall Amp doesn’t mean that is what you need to try out for the first time in the studio. Stick to what you know works. Use minimum effects on your tracks. More can be added later. Don’t stop playing every time you make a mistake. If you stop recording every time someone makes a little mistake you will be here for the rest of your lives. It’s much easier to over dub or replace just the mistakes after the song is finished. Practice with a click track. If your band has a drummer have him or her practice with a click track at a very slow speed. Master that and the faster speeds will just fall into place. If you don’t have a drummer then the bassist and or rhythm guitarist should practice with the click. Drummers with acoustic sets: when possible should make arrangements to arrive a couple of hours before the rest of the band to set up. Every set of drums is a little different and it takes time to get the mics set up just right. If circumstances allow it we can sometimes set them up the day before. Get some rest! Try to rest up before your recording session. You want to feel fresh when you record. You’ll be able to hear the difference. And that includes your ears. The day before you record, don’t listen to any thing at a higher than normal volume. The lower the better. Your ears get tired before the rest of you. Singers rest your voices. Don’t practice all your vocals several hours a day for 2 or 3 days before you record. 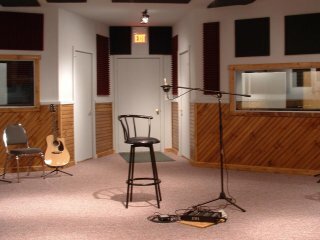 It is a good idea however to start warming up your vocal cords an hour or so before you arrive at the studio. Drink lots of water, but don’t drink anything very cold. NO ICE! Ice constricts your vocal cords and makes it harder to control your voice. Don’t forget the emotion. Music needs emotion. Don’t be afraid to let it all hang out when recording. Decide who in the group has the final word. There are always decisions to be made at different points in the recording process and getting 5 opinions only take up time a makes everyone’s nerves start to fray. If you have someone agreed upon in advance then the engineer always has a “go to guy” that he can get the answers from. This is absolutely a must when the final mixing and mastering starts. Everyone always wants to hear more of himself or herself in the mix. It is always hard for someone involved directly in the project to listen to the music as a whole. Leave your friends and family at home. Sometimes friends and loved ones mean well by offering advice in the middle of a session. Just a look from a significant other can make you change your mind about something or renew a fight that started the night before. We even charge more in most cases if there are non-musicians in your entourage. Allow the engineers time for a pre-final mix-down. By now you should have already conveyed to the engineers the basic sound you are looking for. Now is a good time for you to take a break. Let your ears rest again. Then come back and get to work on getting things exactly the way you want them. Don’t always crank it up loud just so you can hear every instrument. You should be able to hear them at a low volume just as well. A little reverb and compression can go a long way. Adding effects can be fun. It’s why we have a room full of knobs to begin with. But always remember not to over do it. Listen to the mix in several locations. Before you give the final ok for the cd to be pressed, listen to it in your car, your house, a $29 boom box, or anywhere that people who buy it will be listening to it. It’s going to sound different everywhere. Get to the studio on time. If you are booking a 6-hour session starting at 4:00pm, then the clock starts at 4:00pm. Most sessions require a non-refundable 25% deposit to reserve your time with $50.00 being the minimum.